No question it has to be getting to stop along the way anywhere and as often as either one fancies. Recently, on the ride home from a girl-trip to North Carolina, my friend and I stopped at an adorable garden shop in Richmond Hills, Georgia. It was the kind where design was as evident as function. I liked it so much that if I had my own garden shop this would be the model. 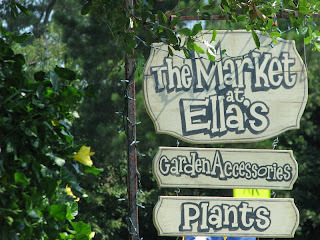 There were many of the same plants for sale there that we have here in Florida. The chalkboard sign at the back of the parking lot with the castaway, scraggly-looking plants surrounding it caught my eye right away. This was an odd sight. In Florida we don't have garden centers that give away anything. Well, I knew we hadn't much room in the vehicle for anything extra but there had to be a way to squeeze in some free plants. The foliage on the tall scrawny plants had my attention on first glance. I didn't recognize them. As a matter of fact I haven't ever seen them growing in Florida. I just liked them and felt certain they might like to find a home at Hoe & Shovel. But wait... I should read the tag to see what they are. Zone 10-11? That's me... that's not Georgia! Needless to say, we did some rearranging and fit my free Euphorbias in the car and here they are in my garden. There were enough to plant a few in the back garden and some in the north, side garden. In both locations they have become a layer in the background of greener plants. 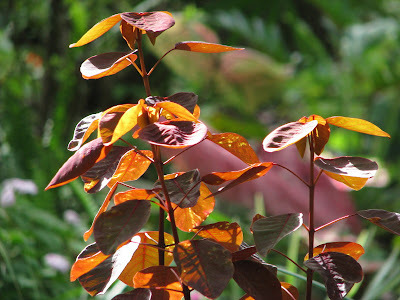 Don't you just love the way they have that coppery glow with the sun shining through their leaves? It will be interesting to see how they adjust to their travels. If they like their new home and decide to perform well I am confident we will have a mutual admiration. Random stopping is one of my favorite parts of a good road trip. No agenda at all! Free is always good too! 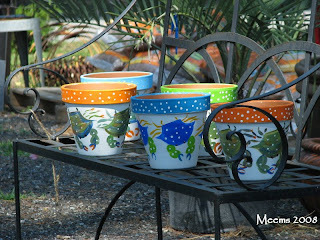 It looks like those new plants are going to make a nice addition to your garden. I hope they adjust beautifully. Free plants? I guess they just wanted them to find a good home...somewhere other than the trash. Good for you. Hope they live to tell the story to their new garden friends. Some people can just make anything look good. Congratulations on your find. Before reading the plant name my first thought was Cotinus...Purple Smoke Tree, these are lovely. You have a good eye meems...free or not, I may have over looked them! On our recent beach trip we took the subaru just in case we saw something we couldn't garden without! Sounds like you had a very enjoyable (and profitable!) trip! Gotta like free plants. I agree with Gail, it looks like a young Cotinus coggygria. You just can't beat the rich colors of the sumac family,and this plant looks like a great southern substitute, and you can't beat the price! Free plants are the best! Sounds like a wonderful trip. I miss those meandering, explore as you go road trips. For some reason they stopped once the kids arrived (grin!). What a great find at a great price! Please do future posts to let us know how your euphorbia is doing.It's really pretty. What beautiful plants....I love the colour and as you say with the sun shining through them....stunning. FREE! You lucky lady. And yes, I think those coppery leaves are keepers. I hope they grow for you. 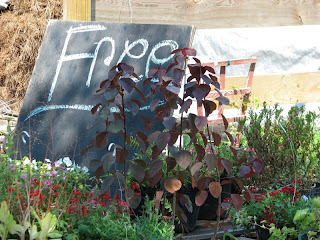 Oh Meems, I have used that Cotinus in past annual containers but they are expensive and while I have been lusting after them I just could not justify the price of them for one season. You are lucky! You can have them year round! 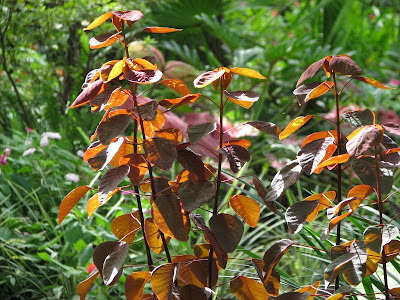 Love the coppery foliage! I meant Euphorbia of course but in a rush to get to bed. Now I will dream of copper glow so thanks! Great find Meems! They're so pretty. How nice that they were giving them away! That doesn't happen every day. mjm: no agenda and random stopping isn't something I am used to - I have to say it isn't only hubby's habit- he's just a little less inclined to stop on a whim. But on this trip I truly had NO agenda which made it very relaxing. serious/silly/me: There were more plants being offered I would have snagged and gladly nursed to health had we more available space in her big Yukon that somehow we had filled to the brim. mother nature: I hope I am one of those folks when it comes to the lanky Euphorbia. Fortunately they don't have to try to be the centerpiece... only the background. Gail: I didn't mention the water fountain I also wanted to fit into the car and just didn't have the wherewithal to unload the entire thing/reorganize to make room for it. Ha! Nancy: There were other offerings I had my eye on in the free pile... pink verbena in hanging baskets. I would have taken them out of the hanging baskets and used them in containers. Alas, I left them for someone else. Sue: The price was definitely right. The tag says the Euphorbia is not tolerant of frost... I will have to give them some special attention should our temps drop that low. Since that rarely happens I see them as another fairly carefree addition to the garden. Amy: Kids do change the way our world is shaped. To tell you the truth hubby and I haven't had kids around for a while and we just don't meander. No, we have purpose! Hee-hee. So it is a nice occasional change to travel with a friend ...or two. 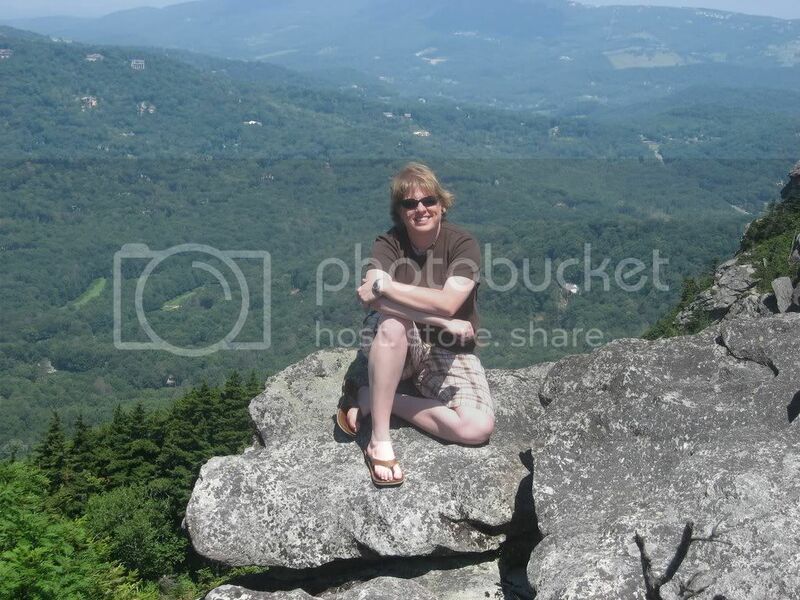 Cheryl: Our hubbies must be related...You gave the perfect description of our road trips. He keeps saying when he retires we will have more 'time' to meander... I just don't think he has it in him... retired or not. Lisa: The nefarious deeds of the armadillos around here continue to try my patience. I have had to replant a couple of the new plants after finding them dug out of the ground. But I do think once they get established they will be just fine here. Layanee: That's an interesting fact I never even pondered. When I stop to think they might be costly elsewhere somehow that makes the FREE find even more satisfying. I am always partial to deeply colored foliage, too. Linda: I can tell you I've never seen a FREE sign at any garden center in our area. Most of the offerings were spent annuals. I just thought it was a great idea for the business owner. How smart to give away plants that haven't sold for whatever reason to folks who would happily give it a go to nurse them back to health. It is better than tossing them. For me, it was a double treat to have a rememberance of the trip in the form of an addition to my garden. You certainly can't beat that price! It sounds like a great deal for an attractive plant. dee: I'm with you on flocking together with birds of a feather... makes for some interesting road trips. Dave: Yes, the price was a bonus to the eye catching foliage! So glad they survived!! Beautiful!! Serious/silly/me...I see that you found your way to the garden of meems!! Lucky you! I love random stops, you never know what you're going to find. Men tend to prefer to "stick to the plan" so it's nice when you can have a nice variety :). Free plants, they sure went to a great home!